YOU are invited to help us thank Couch Distributing and our wonderful volunteers who have kept our chapter strong and visible in the community for the past year! Join us on Monday, October 17th, from 6:00pm – 9:00pm, at Pono Hawaiian Grill, as we celebrate what we love, our oceans, waves, and beaches! We will be honoring our long time contributors Couch Distributing who supports us and our Save the Surf program, and has donating $210,000 over the past 21 years! 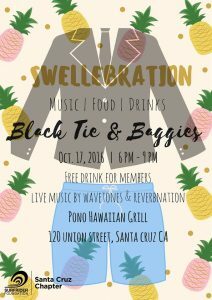 The event will be Black Tie & Baggies themed, so be sure to come dressed up and ready to enjoy some awesome live music provided by Wavetones and Reverbnation! Come hangout with friends, and grab a free drink for members (non-members can also sign-up at event). All active members will receive a free drink and appetizers will be provided. If your membership is not active, you can join/renew at the event! RSVP here (optional). Come down and meet your fellow Surfrider members and Chapter program leaders as we look back at an amazing year in 2016! Surfrider is a ALL VOLUNTEER CHAPTER, there are no paid positions. You can learn how you can get involved and help us protect what we love, our oceans, waves, and beaches! It’s your beach, your ocean, your waves, and your Surfrider Chapter, so Join Us—Help Us— and Support your Local Chapter! This event is FREE, family friendly, and open to the public! We hope to see you there!